Ashtamudi Hospital & Trauma Care Centre is a social initiative in health care started by fifty doctors who have graduated from the various government medical colleges. Majority of them are products of Medical College, Alappuzha. The hospital was started under the umbrella organization – Kerala Academy Of Health Sciences & Research Pvt Ltd. The hospital is aimed at providing quality health care at low cost and develop a socially responsible health care model. We follow Standard Treatment Protocols, Rational Drug Formulary & Therapeutics, etc. and thus bring down the cost. The hospital started functioning on 1-11-2008. The hospital was formally inaugurated on 28-12-2008 by Shri P K Gurudasan, Honourable Minister For Labour, Govt Of Kerala. Dr. R.K.Shenoy (Former Professor Of Medicine, Medical College, Alappuzha) was the guest of honour. The hospital building was designed and constructed by COSTFORD in an environment friendly manner using alternative construction technology. Waste management policy is ecofriendly with biogas plants and water treatment plant executed by ESAF, Thrissur. We started with 18 beds and have increased our bed strength to 75 now. We have 13 departments. In tune with the established mission of the hospital and to take it to better heights, the management of the hospital has been taken over by Swanthanam Hospital Cooperative Society Ltd, Kaluvathukkal P O, Kollam WEF 01/10/2018. At Present, The Hospital is treading new dimensions as a socially responsible health care institution under the able leadership of Shri. G. S. Jayalal MLA. A novel initiative by Ashtamudi Hospital & Trauma Care Centre to take health care delivery to the door steps of the needy.This project is carried out under the Department of Family Medicine.A group of trained nurses attend to home calls and perform minor procedures and nursing services.Areas of service include Wound care, Care of Urinary catheters, Nasogastric Tubes, Tracheostomy Tubes, Collection of Blood Samples for investigations, Measurement of Blood pressure, Administration of medications, Injections, IV Fluids, enema , Senior Care, Palliative Care etc . Family Medicine Consultant - Dr. GITHIN.M.THOMAS MBBS,MD. 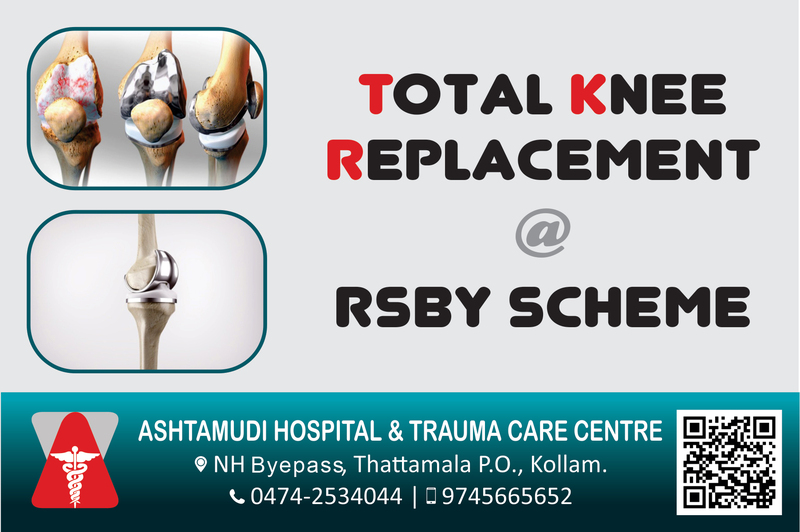 On behalf of Ashtamudi Hospital & Trauma Care Centre, I welcome you to our website. We hope that you will find this site informative and helpful in your healthcare needs.